One state—Texas—had increases but no decreases during the 2007-2011 period compared with 2007, continuing its overall increases over the previous decade and a half. The remaining five states (and the combined total for the rest of the country) each had increased to a peak value in 2007 but then experienced declines. After the initial drop, two states—Florida and New Jersey—had increases in 2007-2011. Three states—California, Illinois and New York—had only declines during this period. The remaining states, as a group, showed a slight decrease by 2009 but no other significant changes. As stated earlier, data limitations for 2012 make it difficult to draw conclusions about change from previous years. For all six states, there are no statistically significant differences between the estimates for 2012 and those for 2007, 2008, 2009, 2010 or 2011. However, discernible differences exist between 2011 and previous years. Because the much larger sample size for 2011 permits us to make stronger statements than for 2012, this analysis will focus most on the years 2007 to 2011. When the 2012 ACS becomes available, it may be possible to make more definitive statements about differences between 2012 and other recent years. Texas, which had 1.7 million unauthorized immigrants in 2012, is the only one of the six states that did not experience declines in unauthorized immigration during 2007-2011. The state’s unauthorized immigrant population increased by 2009, compared with 2007, and also grew in 2011 compared with 2009 and 2010. Looking back to 1990, Texas has had dramatic growth in its unauthorized population (as well as its overall population, which expanded more rapidly than the nation as a whole during this period). The 2012 Texas unauthorized total was nearly four times the size it was in 1990, when it was 450,000. 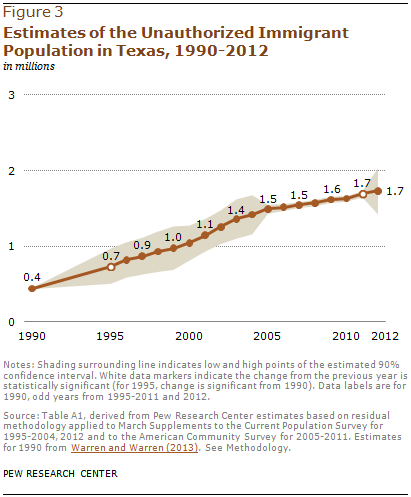 The Texas unauthorized population also more than doubled from 1990 to 2000; from 2000 to 2012, it grew by about two-thirds (66%). 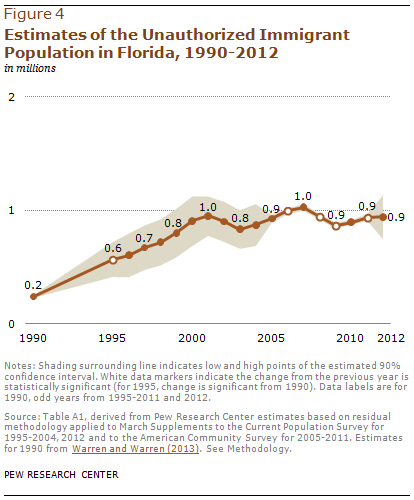 Florida had an estimated 950,000 unauthorized immigrants in 2012. The number declined sharply in 2008 and again in 2009 compared with the previous year. However, the number began growing again after that: In 2011, the estimated unauthorized immigrant population in Florida (950,000) was larger than it had been two years earlier, in 2009 (875,000), but not as large as its peak value in 2007 (1.0 million). California, New York and Illinois had declines in their unauthorized immigrant populations in recent years, but no increases after that. In California, the state with the largest unauthorized immigrant population (2.45 million in 2012), the number declined in 2008 from 2.8 million in 2007 and then declined again in 2009. The decline stopped in 2010 and 2011 but did not change to an increase. These six states have long been home to the majority of the nation’s unauthorized immigrant population, but as foreign-born residents have moved into new destinations, the six are not as dominant as they once were. In 2012, 60% of the unauthorized immigrant population lived in those states, compared with 80% in 1990. While the total number of unauthorized immigrants living in these six large states was 2½ times as high in 2012 (7.0 million) as in 1990 (2.8 million), the total in the remaining states and the District of Columbia was nearly seven times as high in 2012 (4.7 million) as it was in 1990 (700,000). As a group, the remaining states had steady annual increases in their unauthorized immigrant population, which reached 4.75 million in 2007. This growth stopped abruptly after 2007, and by 2009 the number had dropped to 4.55 million. Since then, there has been no statistically significant change in the numbers. Most of this reduction in share in the largest states is due to a sharply reduced proportion in California. 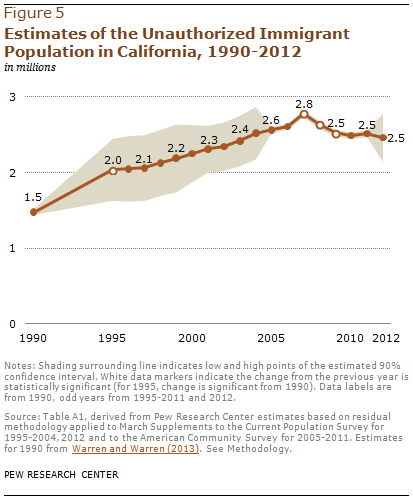 The Golden State had 21% of unauthorized immigrants in 2012, compared with 42% in 1990. Illinois and New York had small declines in their shares of all unauthorized immigrants. The other three states had modest increases.